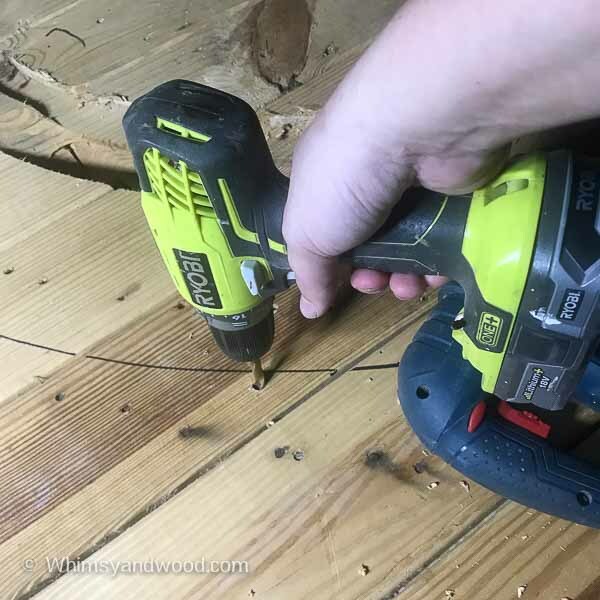 After doing a few cable spool Projects, this really is The Best Way to Cut Down a Cable Spool. Not remove the top from the bottom, but to make the top, bottom, or both surfaces a smaller sized than they were. This post contains affiliate links. Purchases made from these link help support this blog and bring you new content. Thank you for your support! Cable Spools can be very heavy. Get help with this part! If you are using just one side of the spool for your project. 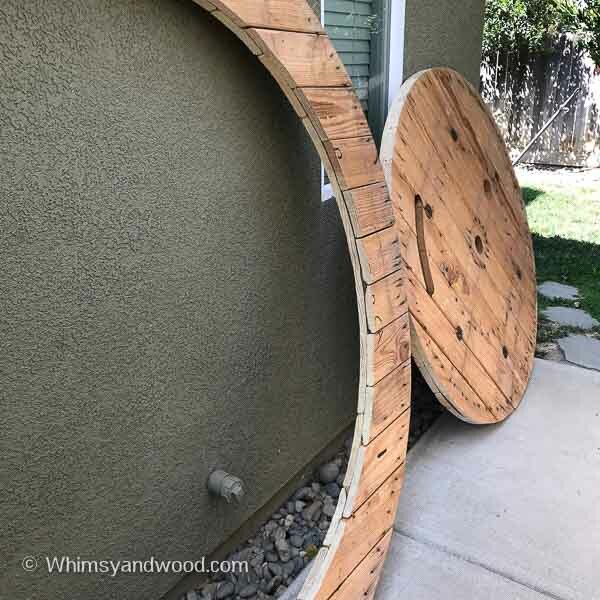 Take your cable spool apart and lay your spool flat on something like a sawhorse. Using your circle jig mark off your circle. For this project a 60" circle was needed. There are many types of Circle jigs you can buy, you can also fashion one from supplies you have on hand. For this one we took a piece of metal from our garage, a screw, and a sharpie. 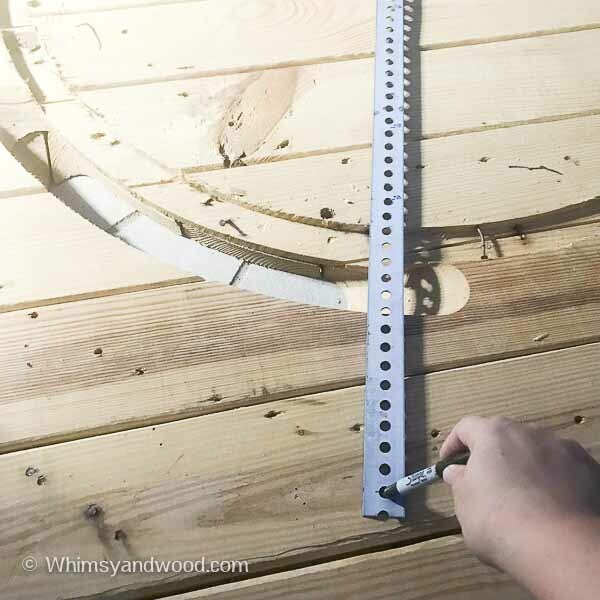 Lay a piece of scrap wood across the hole in the center of the spool and use a couple nails to hold it in place temporarily. Mark center and drive your screw into the wood scrap, but not all the way. You need the top part elevated so you can tie something to it, or in this case loop the scrap metal hole over it. 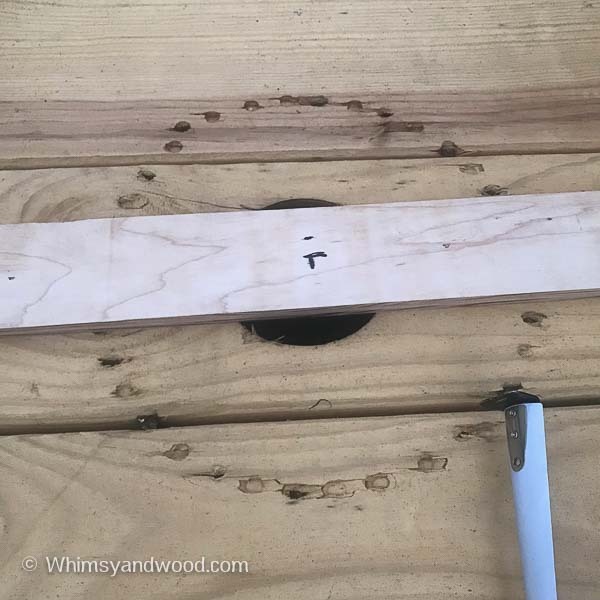 Walk around your cable spool holding the marker and keeping the other end of your jig fastened to the screw. TaDa! You now have your circle. 60" in our case, but you can use this to make any size. 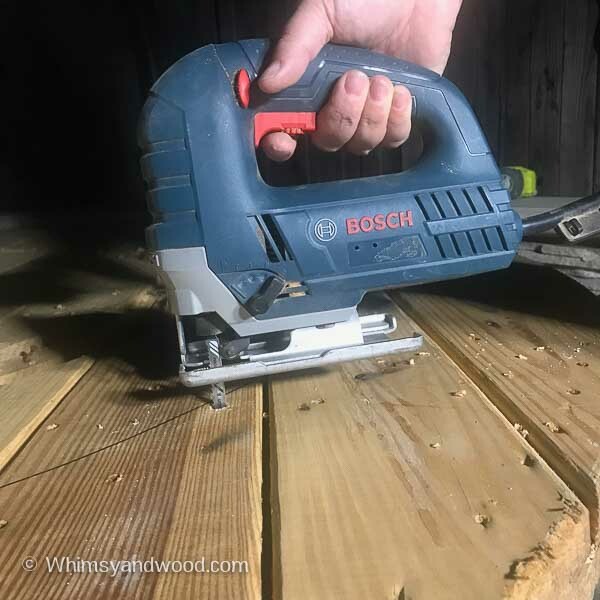 For this step you will need your drill, jigsaw, and your blade that cuts both wood & metal. Grab your drill & a drill bit that is large enough to put your blade down into. Now you get to use your jigsaw. The blades you use need to be longer than the piece you are cutting. I was able to find 6" blades at Lowes that were the wood & metal type. They also had a 10" long blade...I bought one...Just in case. Ideally you will have your cable spool on saw horses. 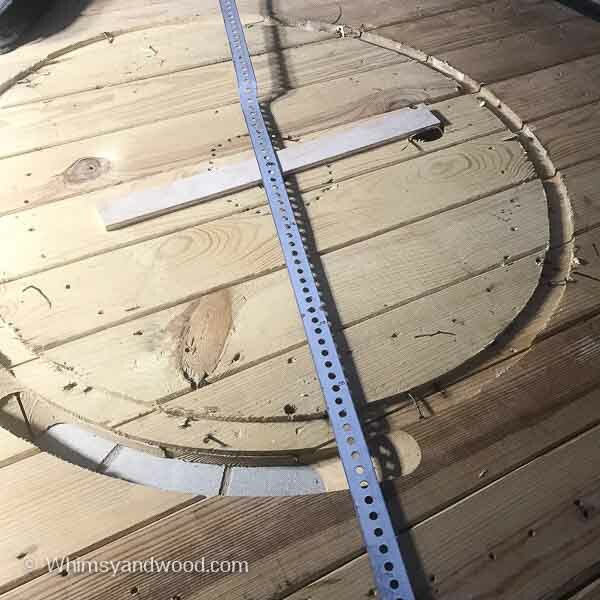 If you have your cable spool on the ground you need to elevate it enough that when you are cutting you have enough clearance that your blade will not hit the ground. I had mine on top of my cement fire pit. I did have to move it around a little so I did not run into my fire pit. I find I have the most control at a low to medium speed on the jigsaw. Keep your eye on where you are headed with your blade more than where you are at. Not far ahead, but looking 1-4" ahead works well for me. I find that if I look dead at the line I am on, I end up inside the line easily. As you cut your edge off you may find the sagging part that is being cut off will make it harder to cut. It puts pressure on you blade pinning and binding it as you try to go forward. You can fix this by adding additional supports to hold it, or cutting away small sections as you go. Finally it is time to sand, sand, sand. Put your headphones on and choose some good music or an audiobook. If you are sanding back to the cut line, use an 80" grit sand paper to remove the wood quickly. As you get to your line, switch to a 120 grit and keep your sander moving as you blend your circle sides. Stain, paint or finish however fits your needs. You can see some of our Cable Spool Projects.